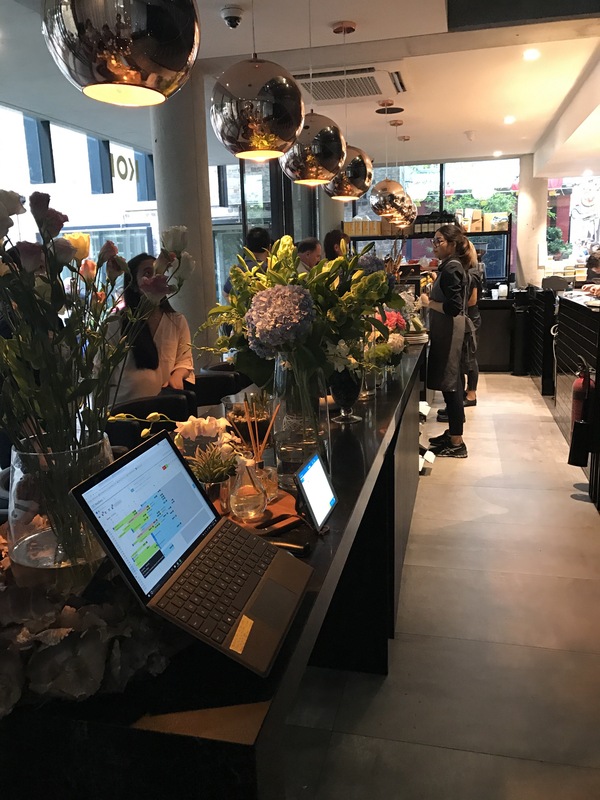 With an optimistic approach, I didn’t think The Grounds of the City would be that busy as it was brunch time on a weekday but as we turned the corner at The Galeries, TimmyC and I were faced with a large crowd. Luckily most of them were waiting for coffee and takeaways and the line for a table was relatively short. We placed our name and number for a table of two on the list and was advised that there’d be a 20-30 minute wait, 18 minutes later we received an SMS that our table was ready. Walking inside the restaurant was like teleporting back to an era where men would wear hats with suits and would read the newspaper instead of staring at their phones. There were so many things to look at, I didn’t know which way to turn my head until my gaze was distracted by the cake trolley. Yes, you read that right, you can request the cake trolley to be wheeled to you. 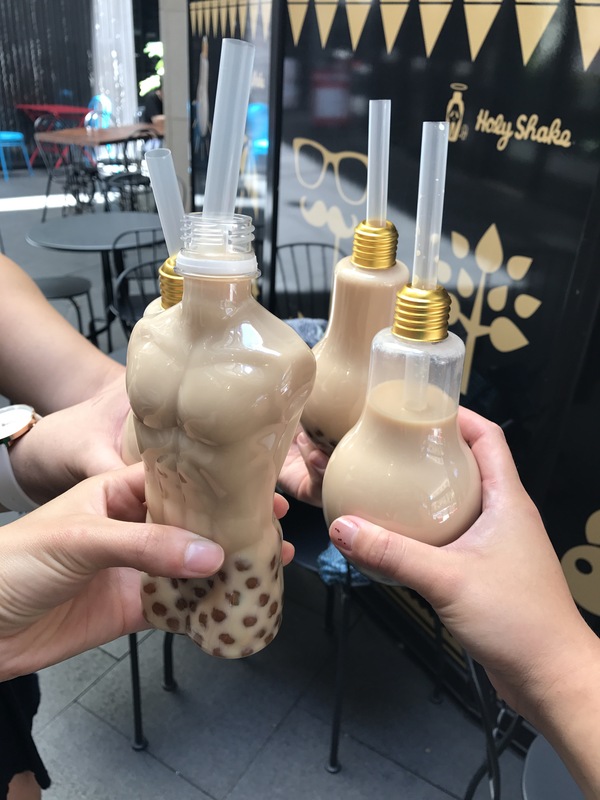 I feel it would pair perfectly with a bottomless cup of tea (which is also on the menu). Flat white ($4.00). TimmyC really enjoyed his coffee, I now understand why there was a huge queue outside waiting for takeaway. Black truffle omelette with mushrooms and goats curd ($28.00) plus a side of bacon ($5.00). TimmyC at first had chosen eggs benedict for breakfast which was quickly vetoed by me as I heard about the specials. This choice was so popular, it was sold out soon after we had placed our order. 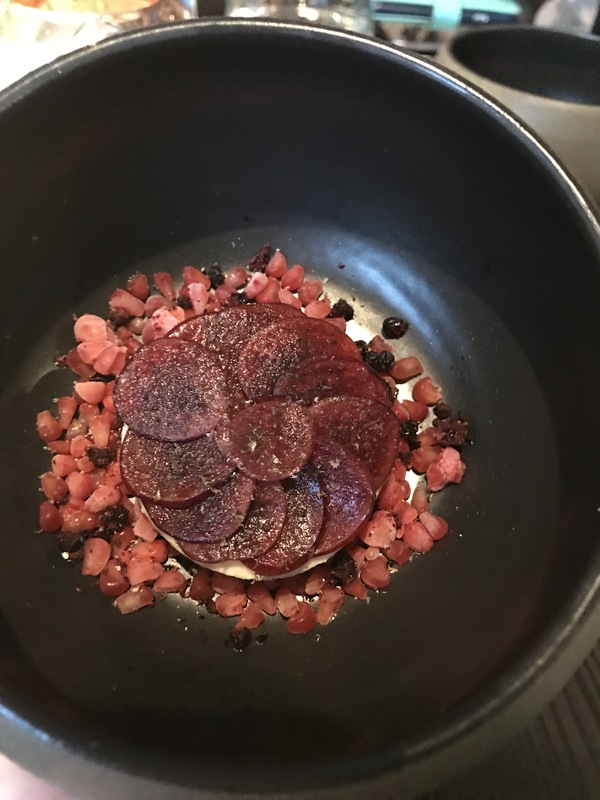 When the server placed the plate on the table, I found the smell of truffles intoxicating. The omelette was perfectly cooked and I really enjoyed the addition of the subtle sourness that the creamy goats curd provided. I loved how ordering a side of bacon meant a plate of bacon rather than just a single rasher- WIN! The Bakery Basket The Grounds continental selection of freshly baked pastries with house-made preserves, cultured butter and whipped mascarpone ($16.00). 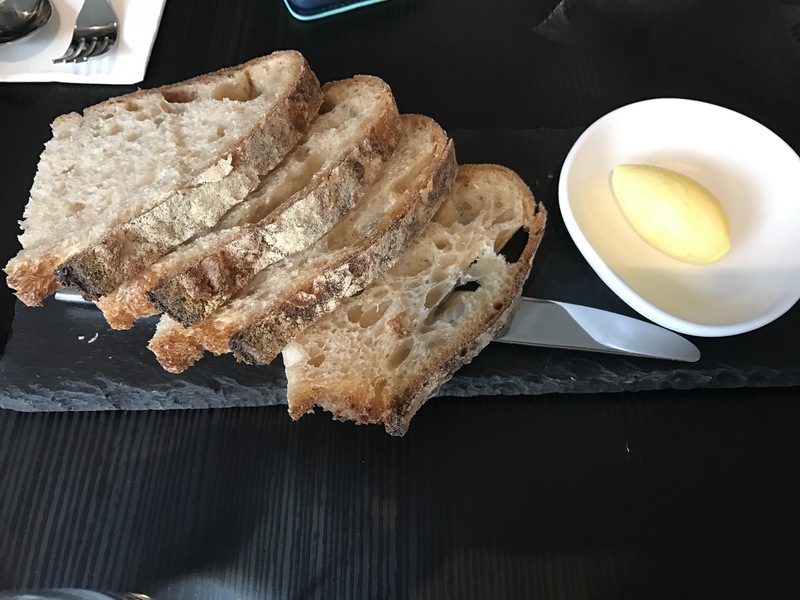 I thought the delicious flaky buttery pastries didn’t need anything more, so not to waste the delicious condiments, we ordered a slice of sour dough toast ($4.00). I loved everything about this (I even started to just eat the mascarpone when I ran out of things to spread it on) and thinking about it again makes me salivate. The cherry on top was that they warmed the pain au chocolat perfectly to give a molten chocolate centre. So delicious and melty on the inside while being crispy and flaky on the outside. 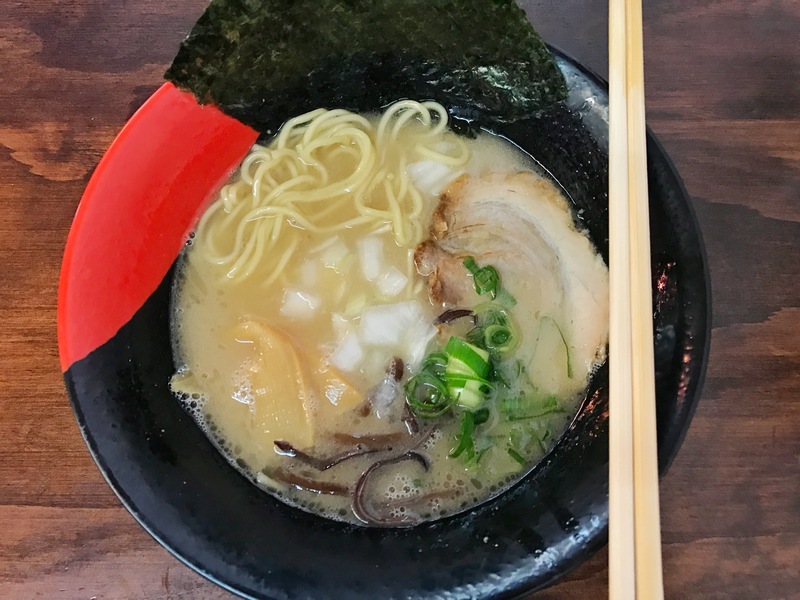 When eating in Sydney CBD, I can tell you where to get ramen, congee, thai stir fries, dumplings and baos, but if you wanted a good brunch spot, I’d be lost for words. The Grounds of the City fills that void and then some. I cannot wait to go back to try more from all parts of their menu and might even stick around for a bottomless cup of tea. Finding myself up the top end of the CBD wanting to get breakfast, I knew exactly where I wanted to go. 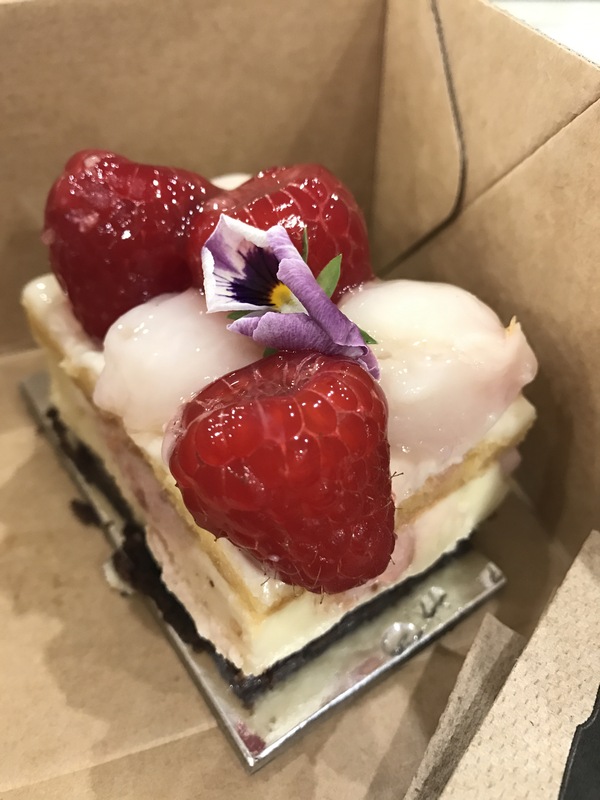 My sister had told me about Lorraine’s Patisserie ages ago and ever since then, I have wanted to try their famous strawberry and mascarpone cake. 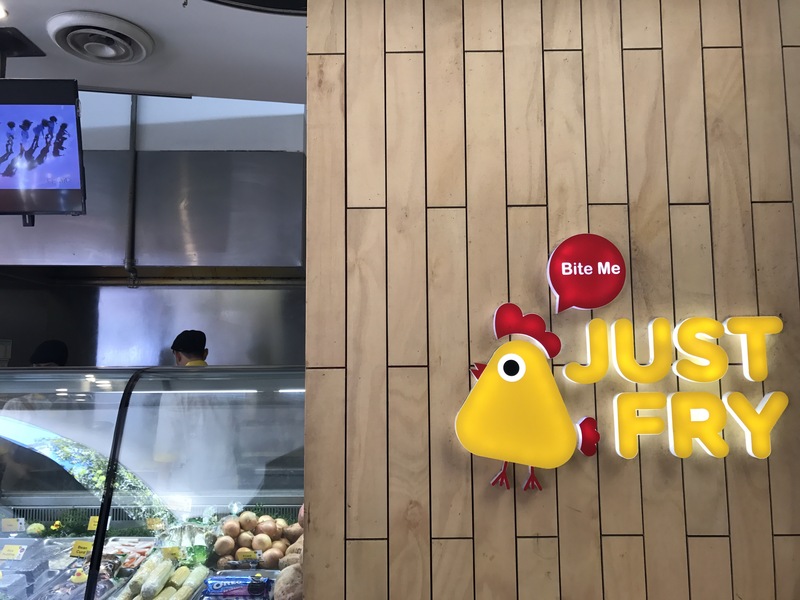 It was just a few streets away from Pitt Street Mall, tucked in down the end of a cute little hipster-friendly looking alleyway lined with other funky modern shops. I was surprised to see that the patisserie was really small with no seating and they didn’t sell any beverages – but that didn’t matter as we found the cake cabinet very inviting. We grabbed a few things and headed into the sun filled seats of Martin Place to eat our breakfast. Croissant ($4.00). We were tempted to go back and get another croissant, we basically finished it a few steps away from the shop front. Choc eclair puff ($5.50). This was heaven. The choux pastry was perfect with its little bit of crunch, the vanilla bean cream was divine all topped off with the right amount of chocolate. I was also tempted to get another one of these as TimmyC ate most of this one. Mascarpone cake lightened mascarpone, layered with crispy coconut dacquoise, fresh strawberries ($10.00). The perfect marriage of strawberries and mascarpone with an added delight of the chewy coconut dacquoise layers. As much as I enjoyed this, I preferred the choc éclair puff more as it didn’t have the hype and expectations placed on it like the mascarpone cake had. I thought the price of one cake was a little steep considering its small serving size. Sausage roll. Not the most delicious sausage roll I’ve had but it provided a good savoury relief from all the sweets I was having for breakfast. I am eager to head back there and eat more of these cakes and croissants while hopefully also getting to taste more of their cake range. What I wouldn’t give to be in Melbourne right now; snacking on cheese and prosciutto in Federation Square watching a live stream of the World’s 50 Best awards as they are happening. It is the second awards show to happen outside of London in its 15 year history and tonight is the first official public screening of the event. Knowing I couldn’t be in Melbourne tonight, I did the next best thing. 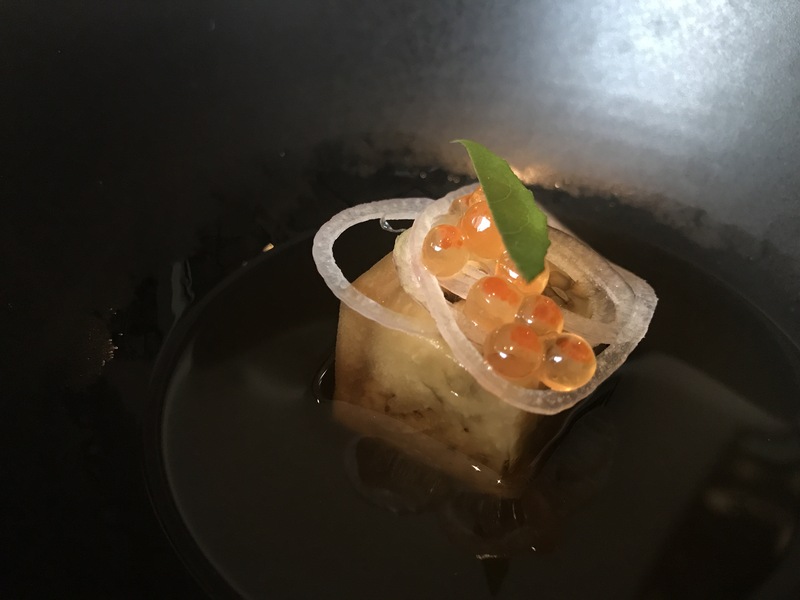 I attended the #worlds50best talk in Sydney last weekend. Like a true fan girl, I was on the Sydney Opera House website as soon as the tickets went for sale. 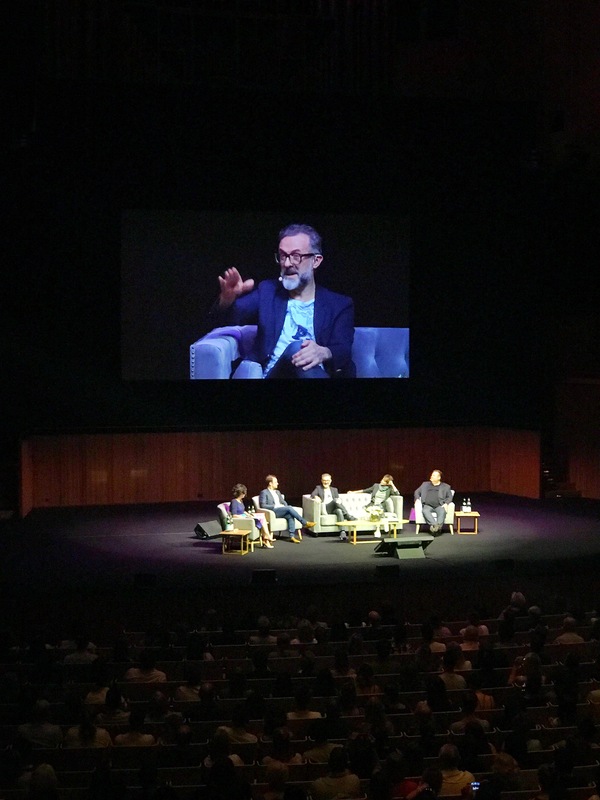 For me the panel was star studded with Massimo Bottura (Osteria Francescana), Brett Graham (The Ledbury), Dominique Crenn (Atelier Crenn) and local chef Peter Gilmore (Quay and Bennelong) with Annabel Crabb as MC. The hour talk went by so fast, covering how each chef started and talking about their experiences. I was the most excited to hear from Massimo but I ended up leaving as a true fan of Dominique Crenn, with her confidence and witty honest responses. The Q&A segment saw an audience member ask ‘as a female, when did Dominique decide between career and family life?’ The room felt uncomfortable as he kept finishing almost every sentence with ‘no offence’, but her response was simple- he didn’t know anything about her life. In fact she does have kids, so do the other male chefs on stage. So why ask her specifically? She offered to have a drink with the man or go out dancing afterwards if he wanted to talk about it further in person but she invited him for now during a limited timed event about food to ask a different question. What a champion! I’ll be closely watching the #worlds50best FB page and count my way down from #50-1 for 2017. 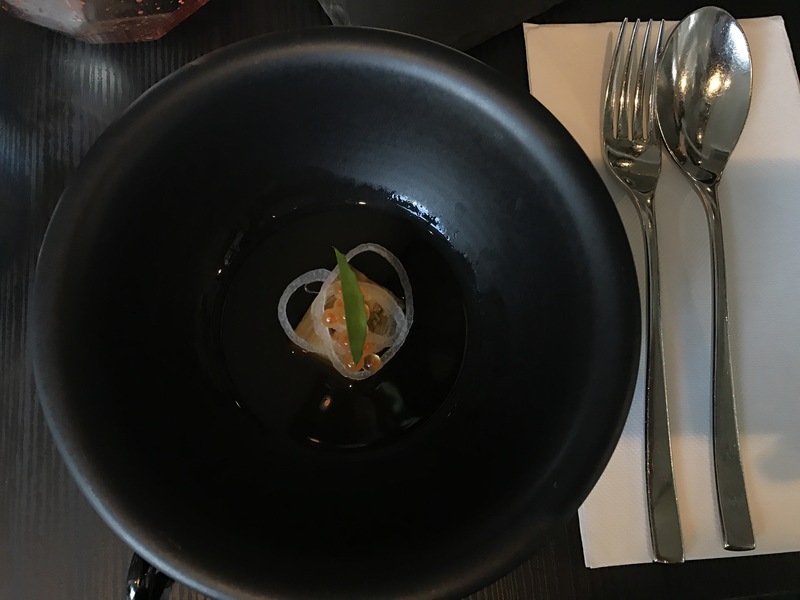 This arrived so quickly and the portion was so small, I had initially mistaken it for an amuse bouche. I loved the clean presentation but I found the broth’s harsh eggplant burnt taste too much like baba ganoush, which I’m not really a fan of. 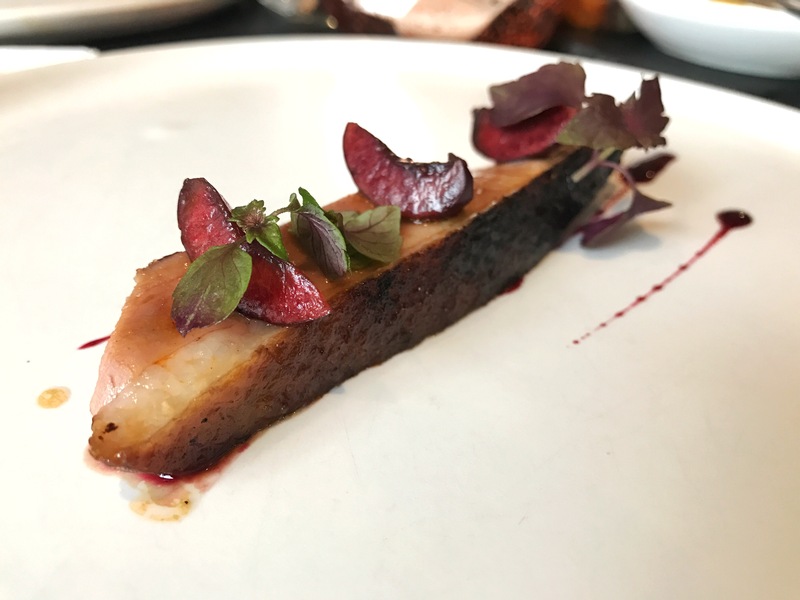 I loved how they cut the cherries in tiny little precise wedges; they made for gorgeous adorning presentation and provided just that little bit of sweetness to the duck. 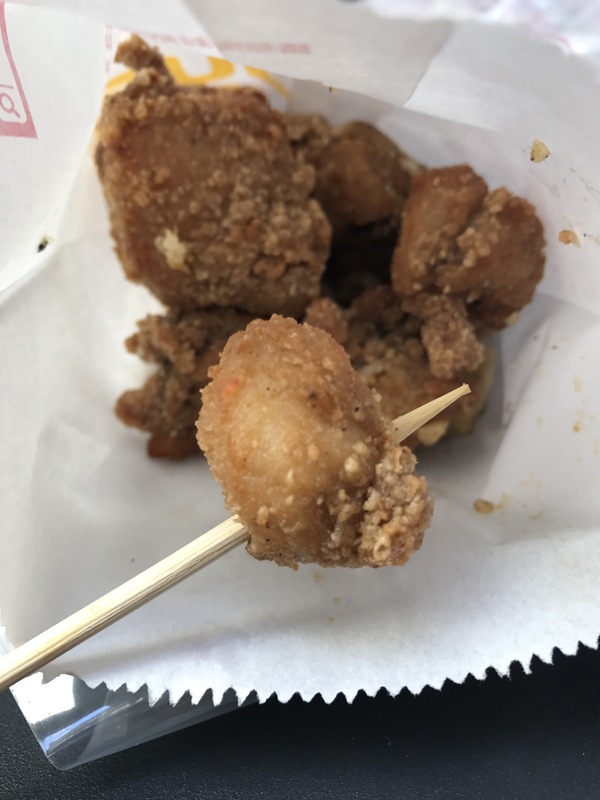 There was a good meat to fat to skin ratio, it was just a shame that it was all over in a matter of a few bites. 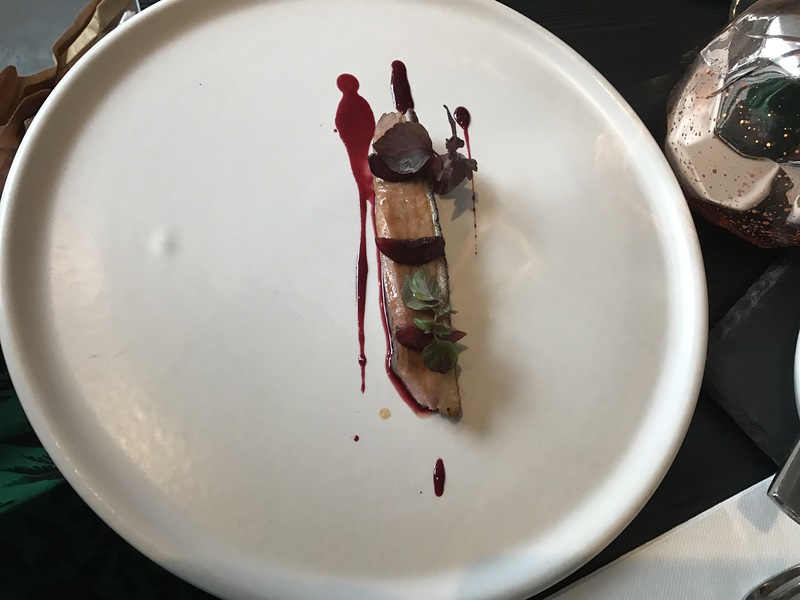 After my first bite, I thought I really enjoyed this course until I realised what I really like was the mushroom puree. 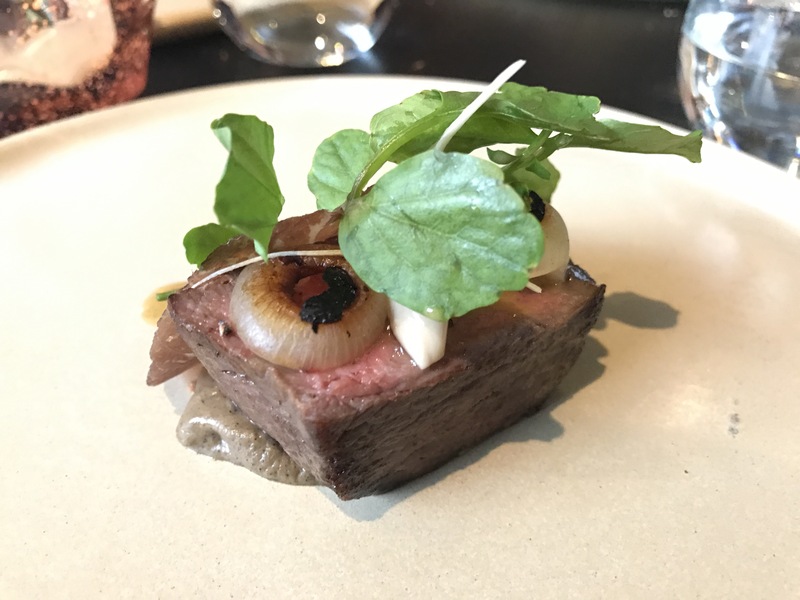 We were all a bit disappointed as the duck course had set the bar high and the beef was hard to cut and a little chewy. Oh wow, I loved the way they presented the cherries. The mousse was super delicate and carried well to sweeten the flavours from all the fruit. Despite the presence of long pepper, there was only a subtle amount of heat. This was delicious. 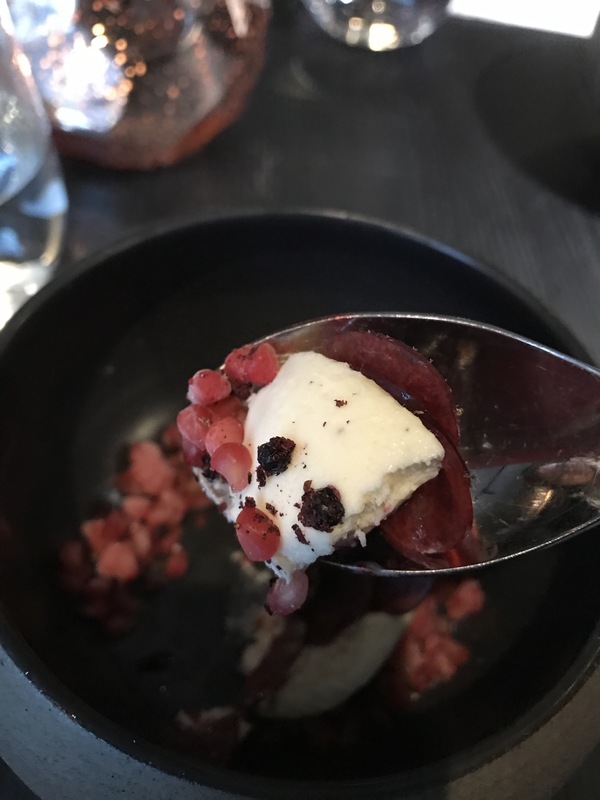 It was no surprise that chocolate paired well with berries but I made a disgusted face when I bit into the burnt citrus; it was a very harsh flavour and I did not enjoy it. The caramel was a beautiful way to finish off the dessert though, I could just sit and eat that all day. We were all super full from the day’s events but we weren’t one to miss out on a course even if it was optional. It was nice that they let us order one to share between the four of us. 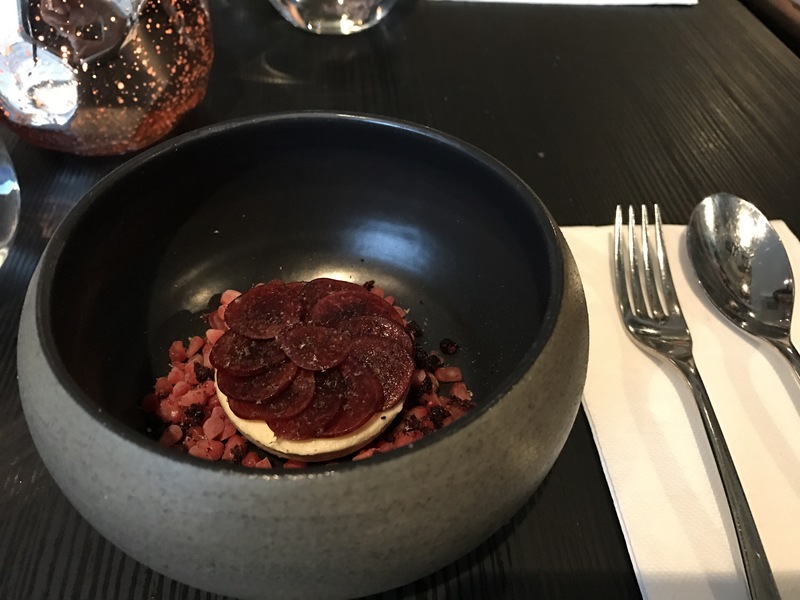 Many different components to this dish and I can’t say that I could taste them all even though I was careful to get a bit of everything on my spoon. 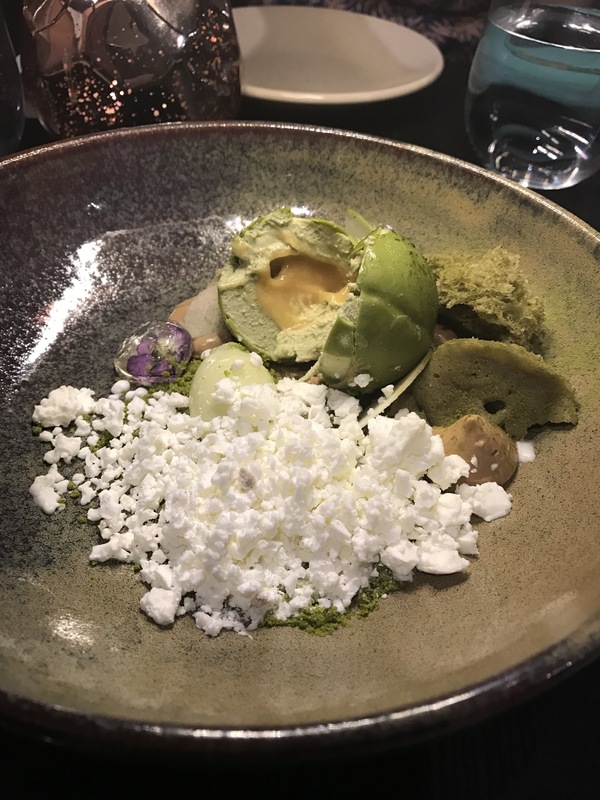 The strong flavours to me came from the nitro lime, yoghurt, white chocolate and apple. I liked how the sour and sweet notes were subsided with the yoghurt and white chocolate. 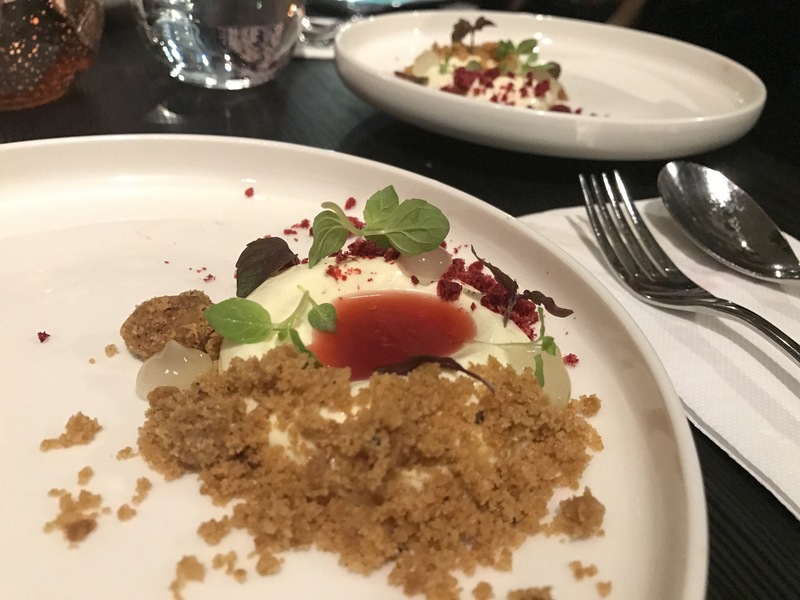 lime cheesecake mousse, brown butter and shiso. 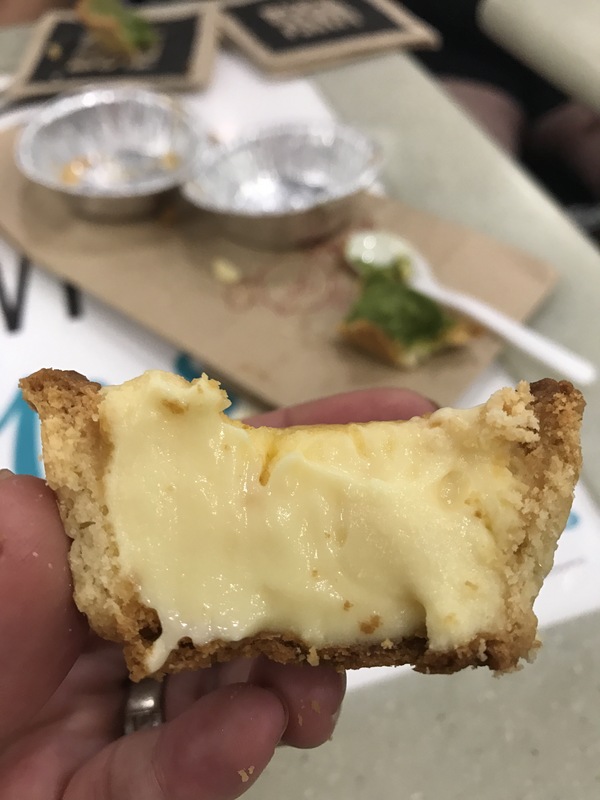 I loved who they made a well out of the cream cheese in this deconstructed cheesecake, I might use that idea if I ever try to recreate something similar. 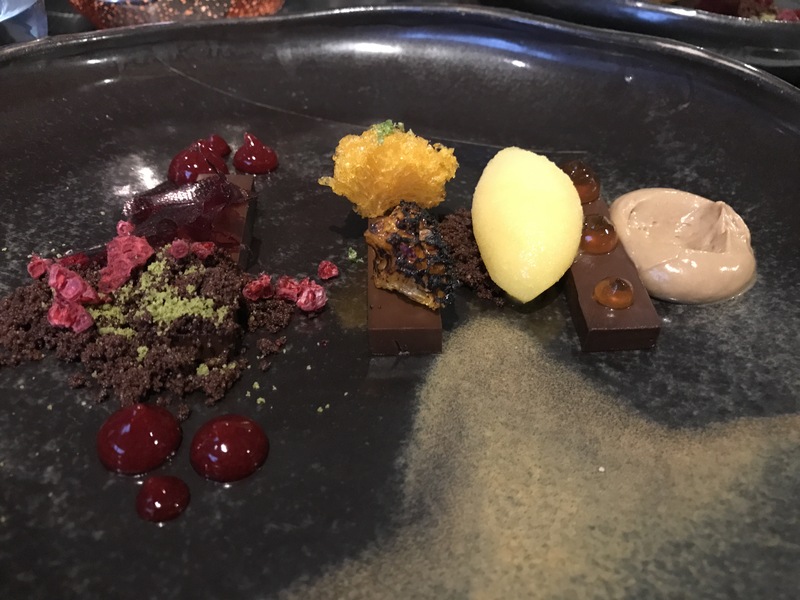 Like all of the previous desserts, this was not a heavy dessert that was OTT; they really understand the balance of flavours and textures. 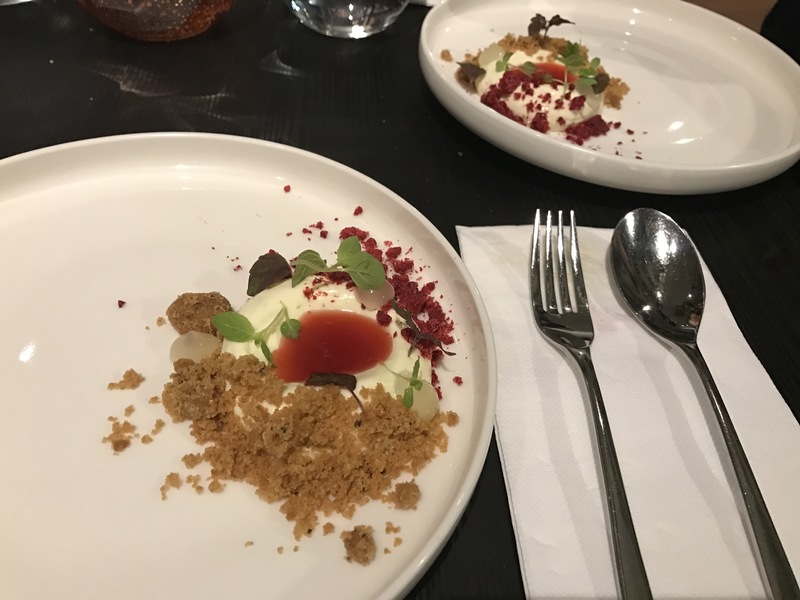 We felt a little up and down about the mains but when the desserts came out, it felt like I was eating at another restaurant. It was seriously next level! And although we had eaten four desserts, I never did feel like something was too sweet or heavy that I couldn’t finish it. I will definitely have to bring TimmyC with me next time I come. I had culled a lot of my backlog drafts but this was one I was desperate to tell you about. I had to been to Mr. Wong once before but without TimmyC which he constantly reminds me about, so when we had some free time between visiting family, we decided to go there for dinner. They don’t take bookings for less than 6 people for dinner, so we had no choice but to wing it. Knowing we had a public holiday on the Monday in Canberra, TimmyC and I figured ‘how busy could a restaurant be on a Sunday night, especially when there was only 3 of us?’, the answer is VERY. We arrived just before 7 pm and the next available table for 3 pax was just after 8:30 pm. 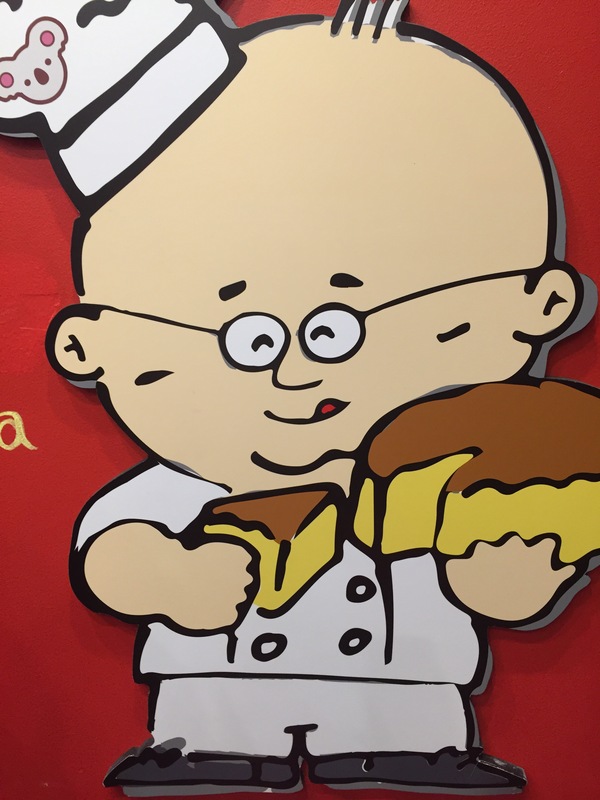 We were there, TimmyC could almost taste the duck, so we put our name down on the list and took a stroll to get some cheesecake from Uncle Tetsu’s while we waited. When we came back more eager than before, the table was still not available yet but they encouraged us to get a drink at the bar. Just after browsing the cocktail list, we were approached by the wait staff again and shown to a table downstairs. All my photos are pretty dark because of the poor lighting inside. Coconut martini mocktail I didn’t get a photo of the description, all I remember is there was kiffir lime ($10.00). I’ve had a lot of mocktails in my time and most of them just end up tasting like a tropical fruit juice or a sweet fizzy soda, but I simply adored this. 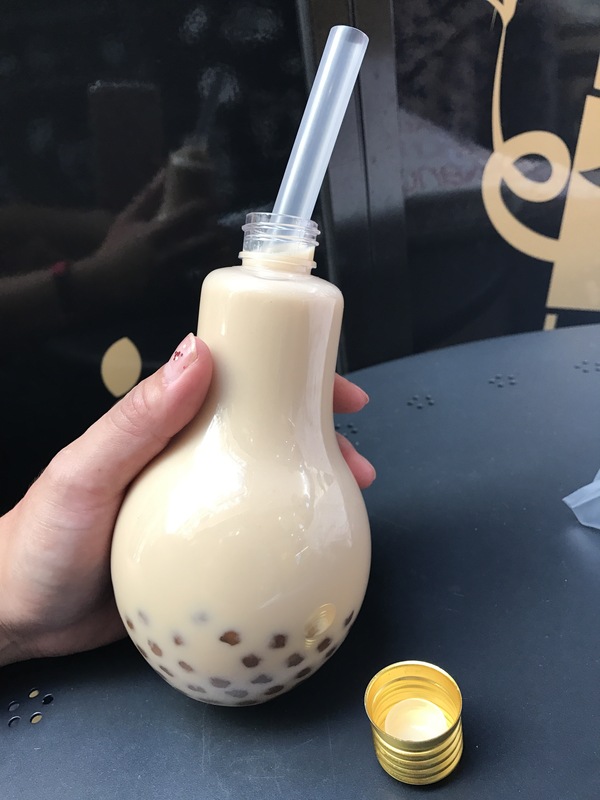 There was so much complexity in the flavours and it morphed as my tongue picked up different flavours, all this within a sip. I can’t wait to go back and go through the rest of the list. Dim sum platters steamed dim sum platter (8 pieces) a selection of today’s specialties ($32.00). The different dumplings were a combination of lobster, duck, scallops and the like. All of them were very delicate, perfect and oh so delicious. I would highly recommend ordering this despite the price tag. Peking duck pancakes (half serve 8 pancakes $45.00). You cannot come to Mr. Wong and not order their duck. It is amazing. I love the duck pieces as it has a good skin to meat ratio, the meat is tender and the skin is impeccable. Prawns, scallops and calamari wok fried with ginger and spring onions ($36.00). To have prawns, scallops and calamari cooked perfectly until it was all tender was fantastic, I just wish there was more of a ‘sear’ to them from the wok. Sweet and sticky pork ribs ($34.00). They did not lie, these ribs were sweet and sticky! Perhaps a little too sweet for my taste, but the meat was very tender. Stir fried snow peas, sugar snap peas and broccoli with garlic and rice wine ($19.00). It was easy to get your fill of vegetables when they tasted this good. King crab fried rice “typhoon shelter style” with garlic and chili (small $24.00). A fried rice is best eaten hot and that is what I told myself as I scoffed mouthfuls of rice like I had not eaten in days. The taste of crab was subtle but I really liked the oomph that the garlic and chili added. Mango pudding with coconut tapioca, lychee granita and mango pearls ($16.00). TimmyC said he was starting to get full already after the starters but he then proceeded to eat the mains, by this stage, he was convinced he had enough and was so full that he could not order the deep fried ice cream that he had his eye on since we sat down. The waitress then came past to see if we wanted any dessert and just as TimmyC finished his ‘no dessert’ declaration to the table, he ordered the mango pudding almost in the same breath. There were no regrets. The mango pudding was silky smooth and we loved the flavour combination with the coconut and lychees. I still dream about those mango pearls. 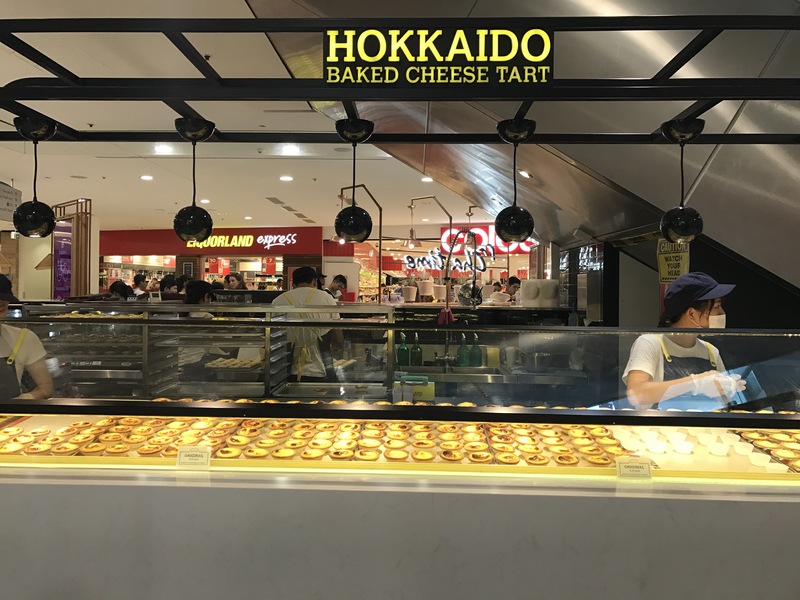 Instead of just being flat one noted gelatinous balls, they actually burst in your mouth releasing sweet and juicy mango flavour, it reminded me of the dessert version of fish roe. Incredible! 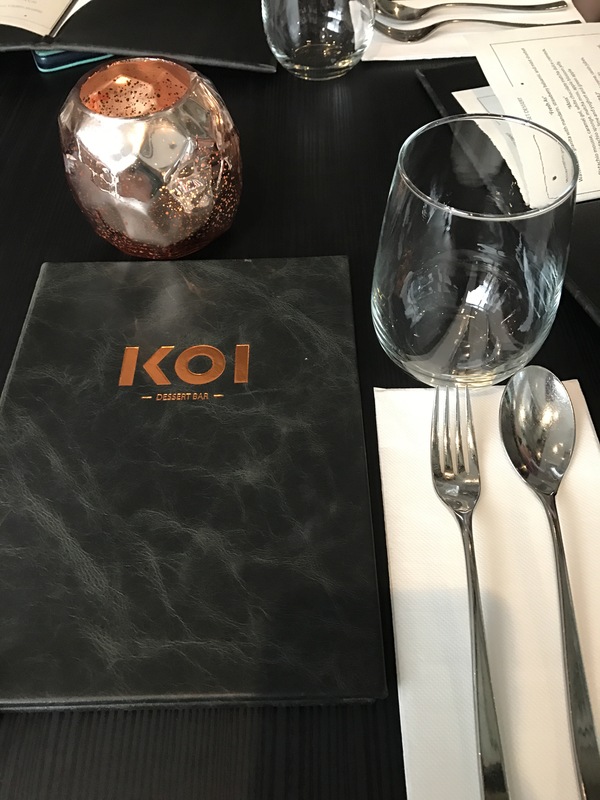 Even though I was impressed by everything from the ambiance, to the efficient staff to the amazing food we had, I think I preferred our starters to the mains. It might have been our menu choices but those starters were seriously next level. I guess we will just have to come back and try more of the menu to know. 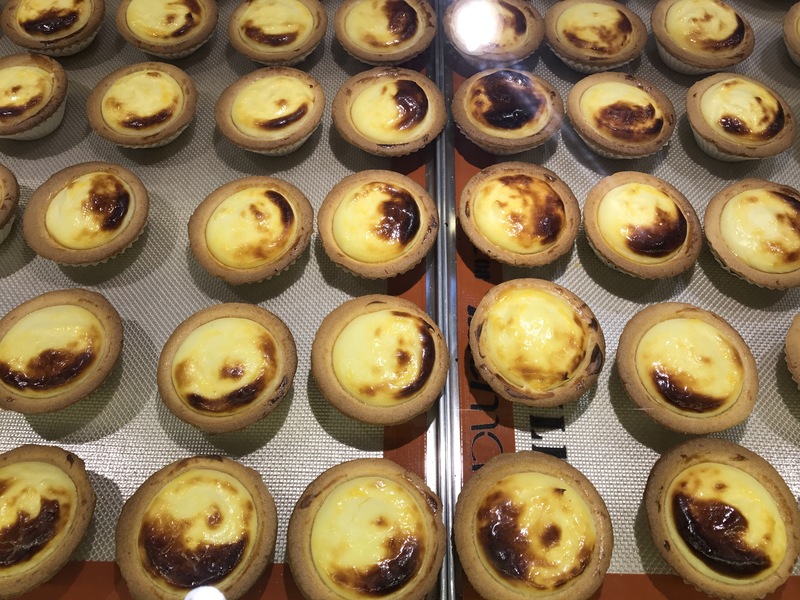 It was raining cats and dogs, so after having a quick lunch at Ryo’s Noodles we were tempted just to go home but my Mumsy told me that there were delicious cakes at La Renaissance in Waterloo and I just couldn’t resist. The convenient under ground parking with an internal door into the building meant we wouldn’t even get wet, so of course we headed straight there. They had a nice spacious setting and a beautiful cake cabinet, which caught out eye immediately. I was a little sceptical about the cakes being over priced, because almost $10 for a small cakes sounds a little ludicrous but my oh my, they are worth every cent. 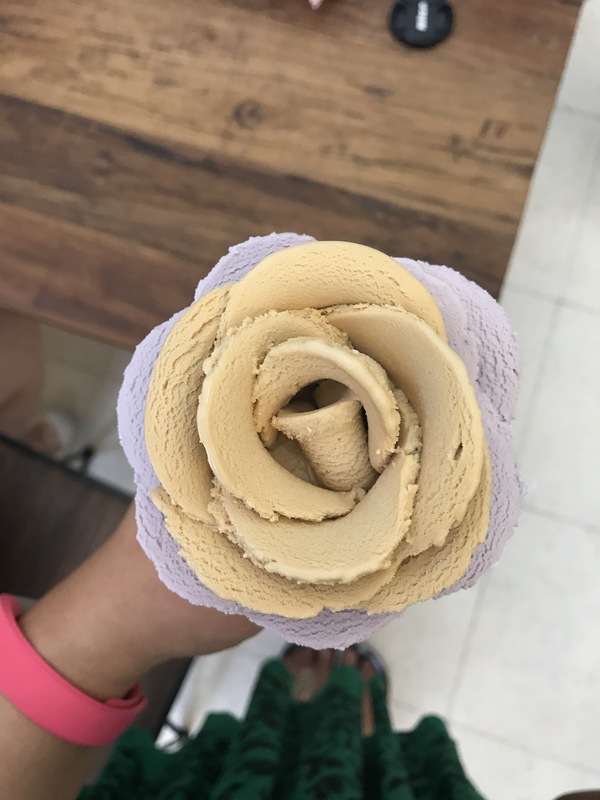 My favourite was the Monet because I really enjoy the white chocolate, raspberry and lychee combo; I found the flavours not to be overly sweet but refreshing with the fruit component. 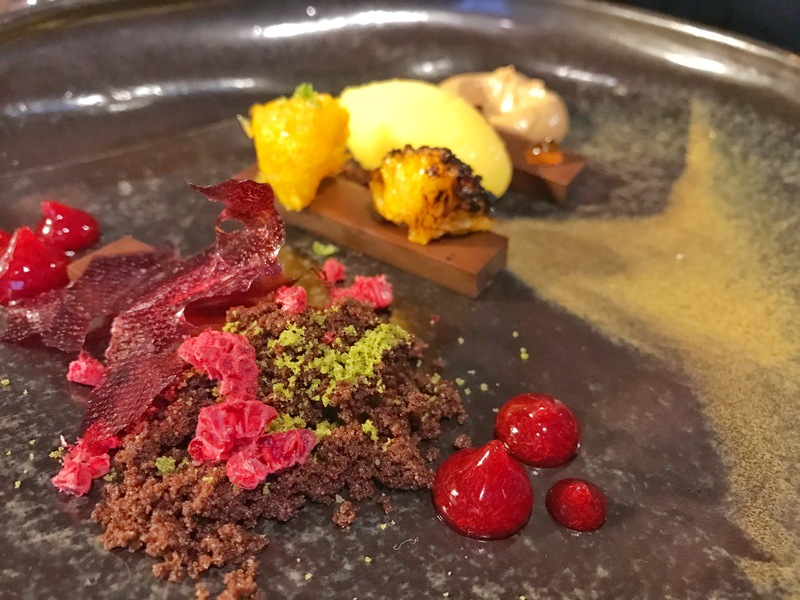 I can see how chocolate lovers would love zulu, if you’re in the area you have to drop by! 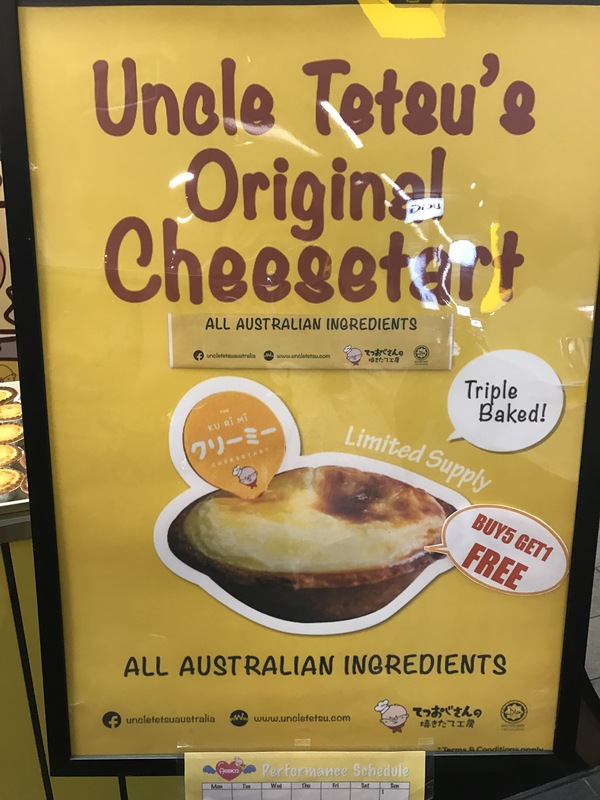 If you some how haven’t heard, Uncle Tetsu opened up their first Australian flagship store in Sydney earlier this year and the lines are notoriously long, you’re only allowed to buy one cake per person (yes you read that right) and they only have four items on the menu. 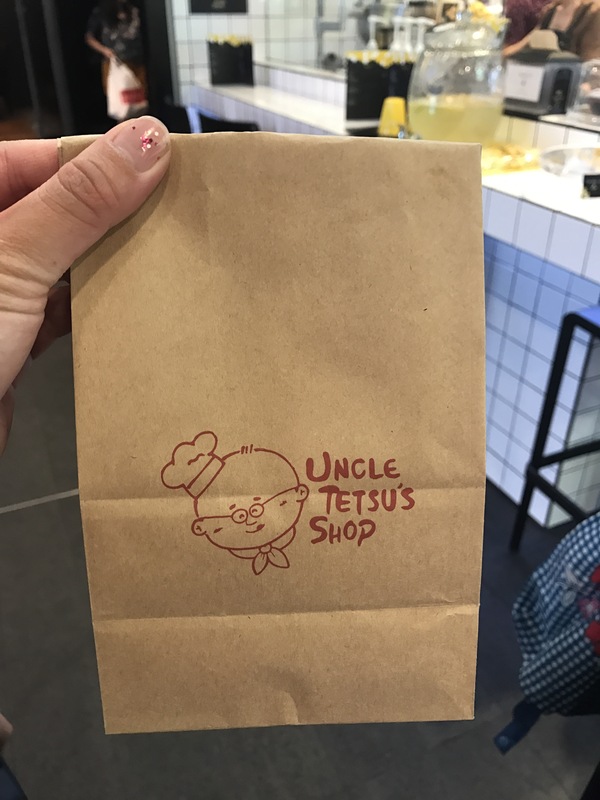 Uncle Tetsu’s menu. I was lucky enough to go during an obscure time while waiting for a restaurant reservation (around 7:20pm on a Sunday night) and basically walked right in but not long after a queue started forming out of no where! As I was outside taking photos of my goodies, all these people started queuing. Signature Japanese cheesecake world famous soft and fluffy light cheesecake ($17.99). We took it home to enjoy and we had it both ‘cool’ and ‘warm’ (microwave a slice for 10 seconds) but we both preferred it warm because it seem to have more flavour. 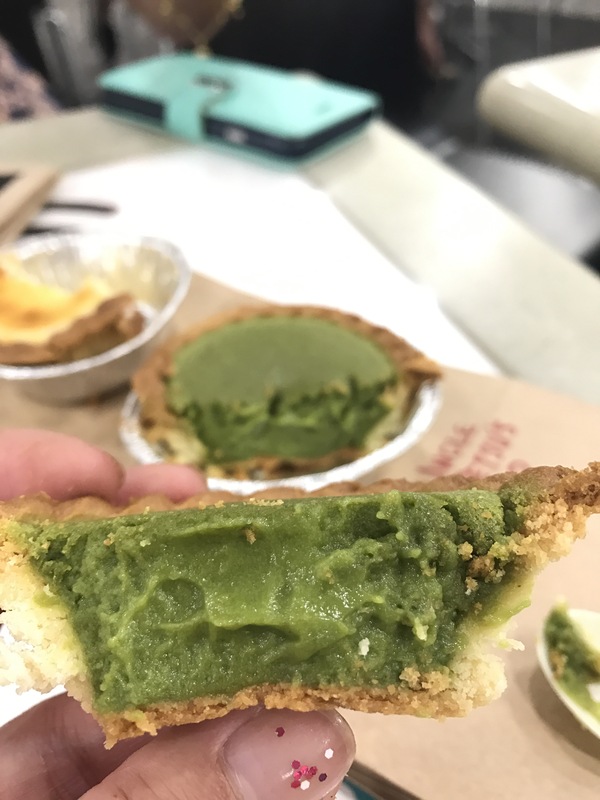 I really enjoyed the light fluffy texture that is unique to Japanese cheesecakes but I wish it a stronger flavour. 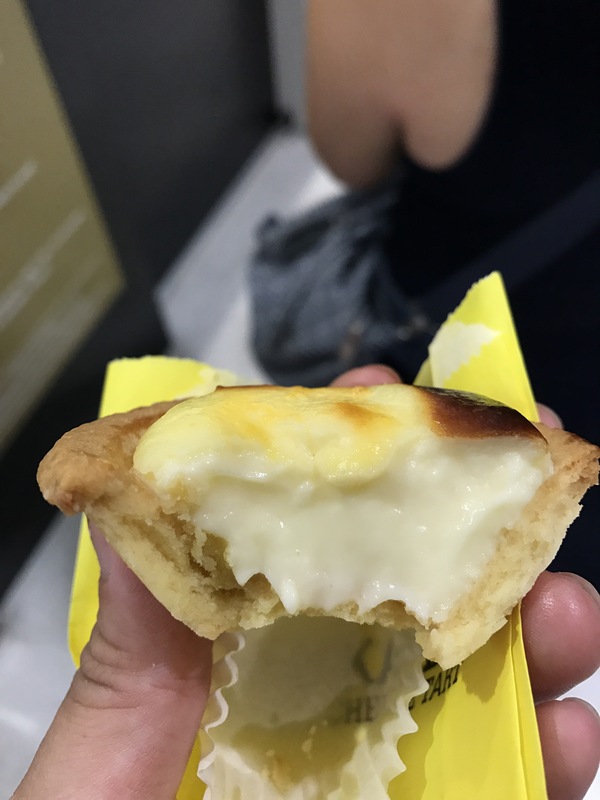 You can easily finish a whole cheesecake by yourself because Japanese cheesecakes are light and fluffy. Here is an obligatory cross sectional photo. Honey Madeleine nostalgic Japanese honey cupcakes (4 pack $15.00). 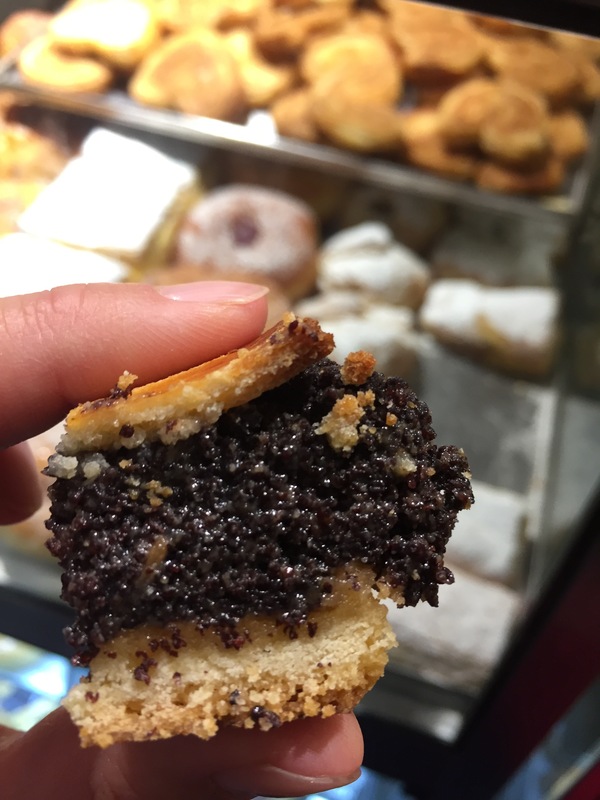 These we dense cakes that had a subtle honey aftertaste. Nothing particularly special and I wouldn’t get them again. My verdict? 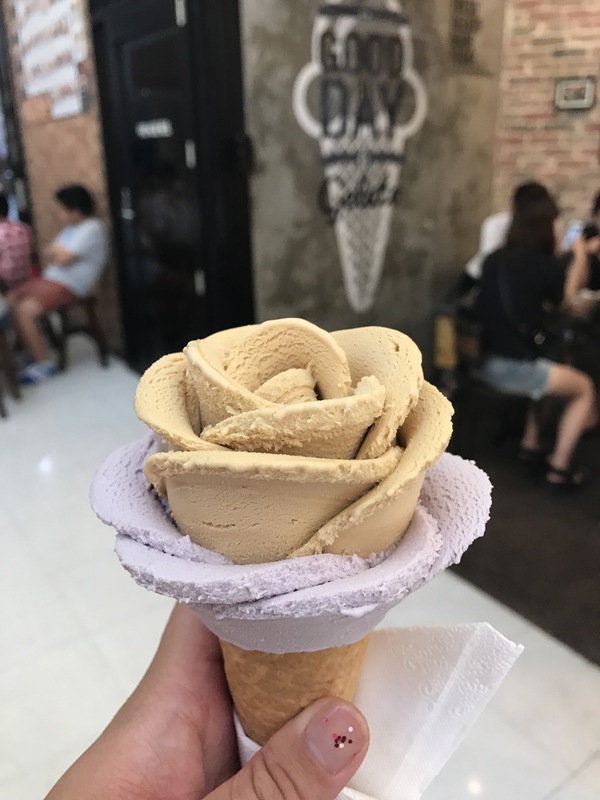 I wouldn’t line up for this but if someone brought some to share, I wouldn’t say no. 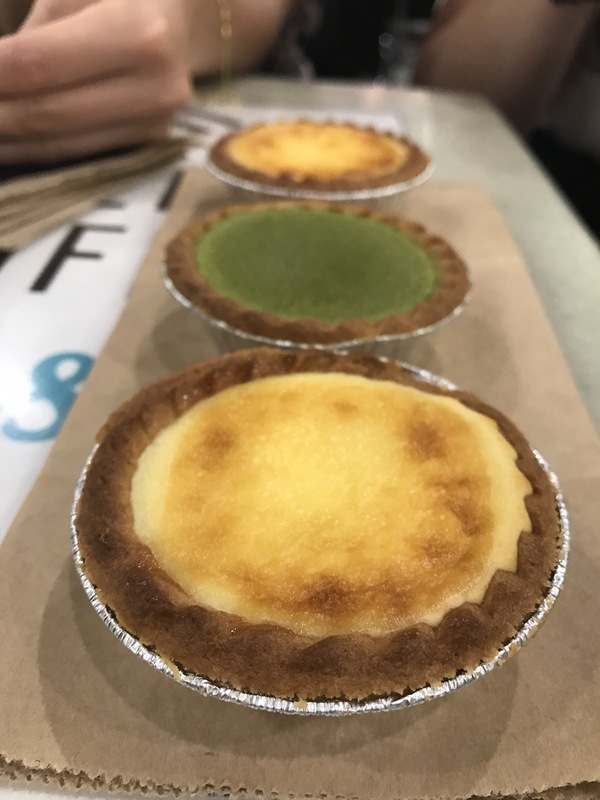 If you have never had a Japanese cheesecake, you must go out and get one now! Continuing on with the European theme even though we had literally been eaten all day, my friends and I were still excited to try Munich Brauhaus on The Rocks. We were very lucky with our timing and were able to catch Vivid on Australia’s iconic landmarks. To aid with digestion, we happily walked around Circular Quay to make our way to the Rocks. The area was buzzing and Munich Brauhaus was not immune, in fact there was a line up at the front and we didn’t know how long the wait was going to be but I optimistically joined the line and within 10 minutes we were seated with another group on a long table. Inside had a great warm atmosphere and it transported us away to another country. Despite being ridiculously busy, service was prompt and so were the food and drinks. I think it is a great testament to an establishment when they have enough staff and are not overwhelmed when packed to the brim. Good pickins apple cider (500mL $12.50). Brez’n Bavarian pretzel Haus made with cultured butter ($4.50). Oh my goodness, a warm pretzel with a good butter is hard to beat. I was in love. Sauerkraut ($7.00). Because you can never have too much sauerkraut on the table. Mashed potato ($7.00). Really smooth and the perfect accompaniment to all the meat. Mushroom sauce ($3.00). I didn’t know if I’d like the bier jus so I ordered this but I really didn’t need to. By this point, we knew there was no room for dessert (for now) as we couldn’t finish our mains. I think I would have been fine if I didn’t go on a food tour all day but the portions are very generous and satisfying. There was traditional live music, the staff were dressed in costume and if you order schnapps, a really skilled waitress manoeuvres her way through the crowd with a really long paddle. 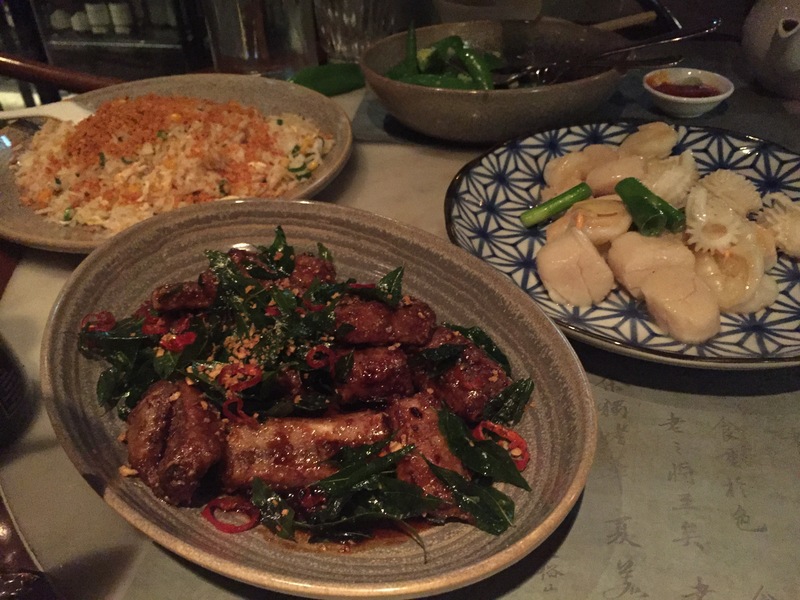 I would happily come here again, I really loved the food, the service and atmosphere. 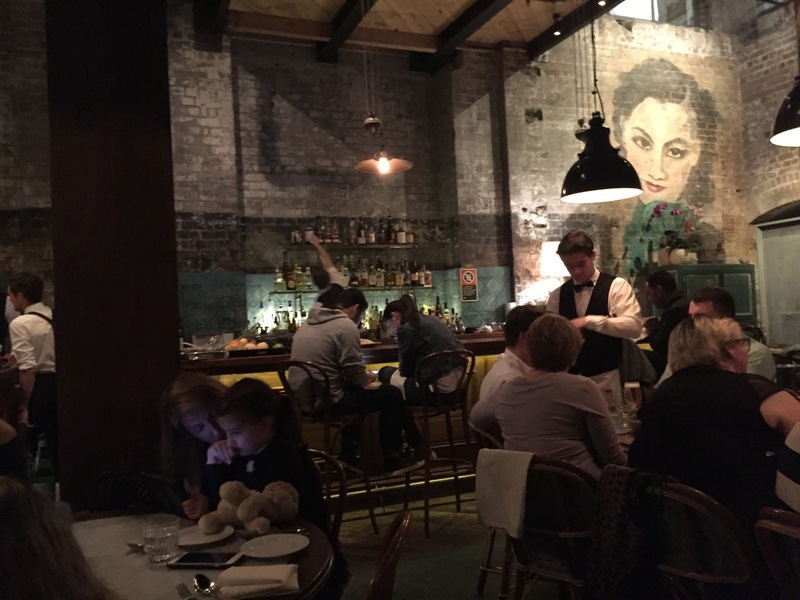 Come with me on a gourmet journey through Sydney. My friends know me so well and for my Christmas gift they purchased me a voucher to have a Gourmet Safari. 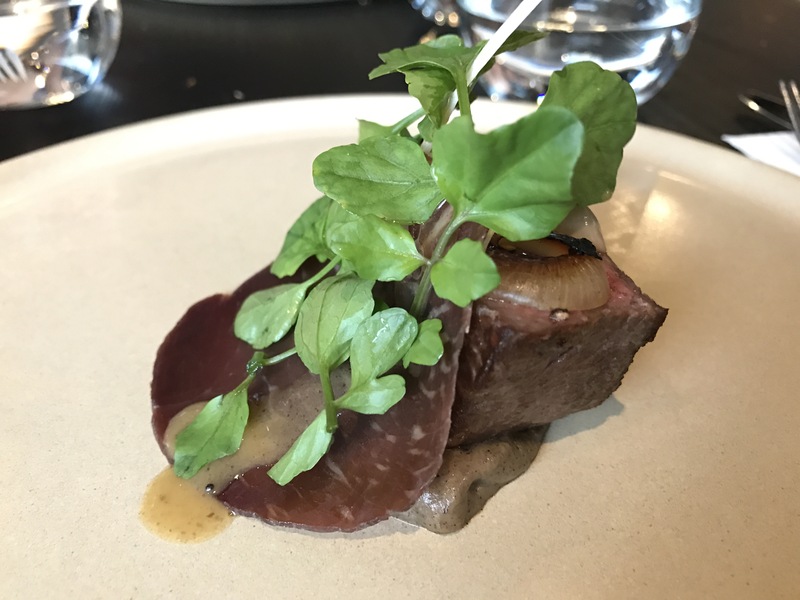 I chose the European Gourmet Food Safari in Sydney to experience a lot of Europe crammed into one exciting and delicious day. Starting the day right with a coffee and their famous ricotta cake that did not disappoint. It is hard to concentrate on anything when there are so many sweets. We left with bags in hand and samples in our mouths. If you don’t know what to get, the kind and friendly staff will help you out. The one thing to buy/try: piroshki, pashka or some delicious European sausages. I was really surprised with the variety in this shop that didn’t just include the traditional bakery wares. The chocolate Kugelhopf is bound to impress but you need a lot of people to share it with or a pair of stretchy pants. 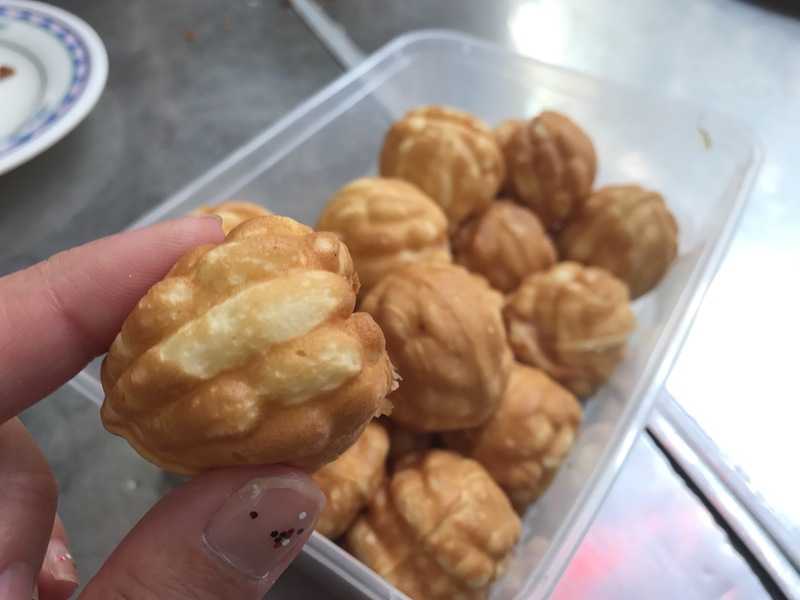 The one thing to buy/try: cream cheese puffs! 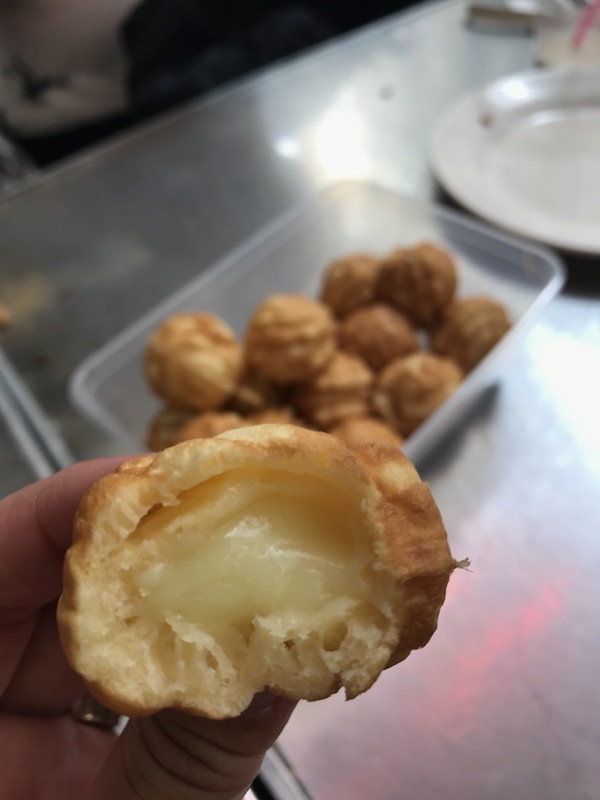 I could have 10 of these cream cheese puffs right now! This is truly cheese heaven. I left with $90 worth of cheese in my hand and everyone I shared it with was also really impressed. They made me eat AND like Stilton cheese which I am still amazed about and they also taught me a lot about ‘ripe’ cheeses and stabilisers. The one thing to buy/try: Guccio Italian bloomy rind cheese (seriously, it is like liquid gold), Stilton with truffle honey or raspberry and herb jelly. You probably don’t need to know this but they deliver Australia wide. So many samples, so many amazing flavours. If I lived in Sydney I would buy my house in Chester Hill. I love how they have every smoked and cured meat product imaginable and all at decent prices. The one thing to buy/try: Cevapi, pork crackling, anything really! My mouth is salivating as I type this. Ivan was really generous and let us try so much and it was all definitely worth trying. Just when we didn’t think we could fit any more food in, we stopped and had a long late lunch. We ate and enjoyed everything! The hospitality was really warm, the menu was authentic and the food was really good. 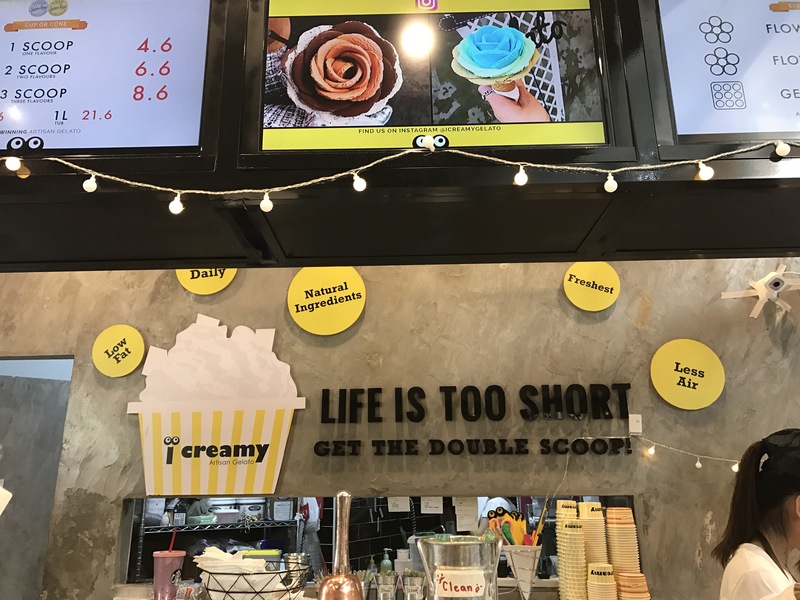 The one thing to buy/try: Everything! 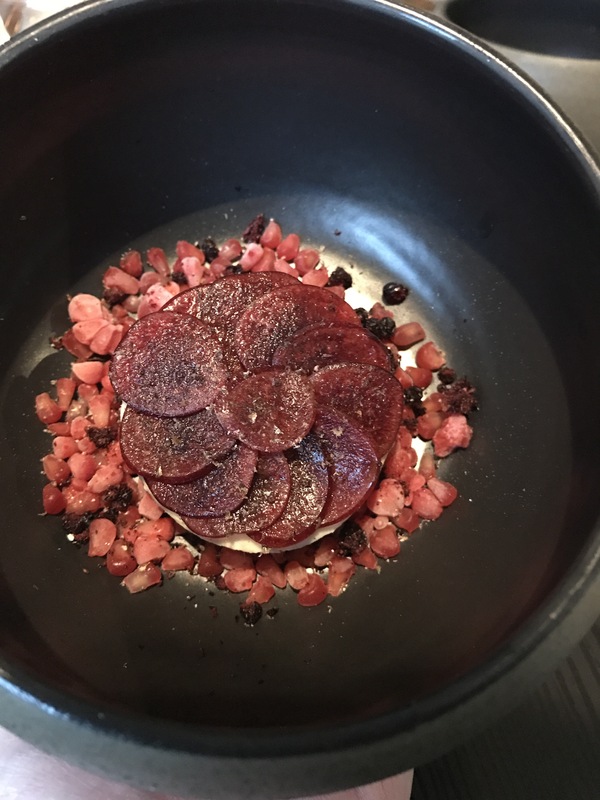 Seriously, I loved everything that we ate at this restaurant even though I was a bit sceptical of the description of seasoned pork lard. 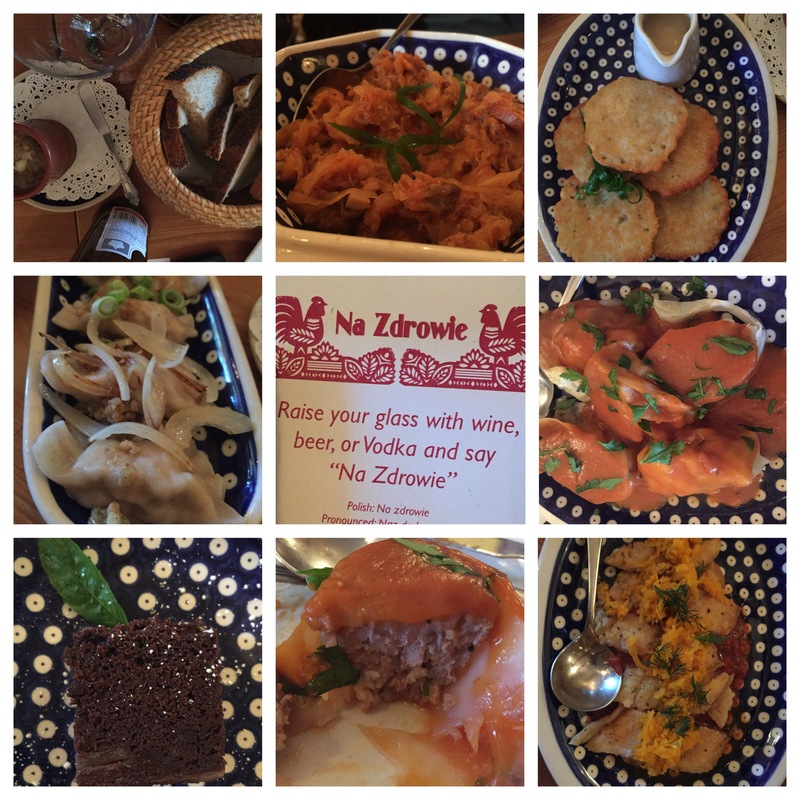 From pierogi to bigos to placki, you have to order it all! We all had such a fun time on the tour, it is definitely worth going on. I learnt so much, ate so much and bought much much more, I hope to go on a different tour soon. 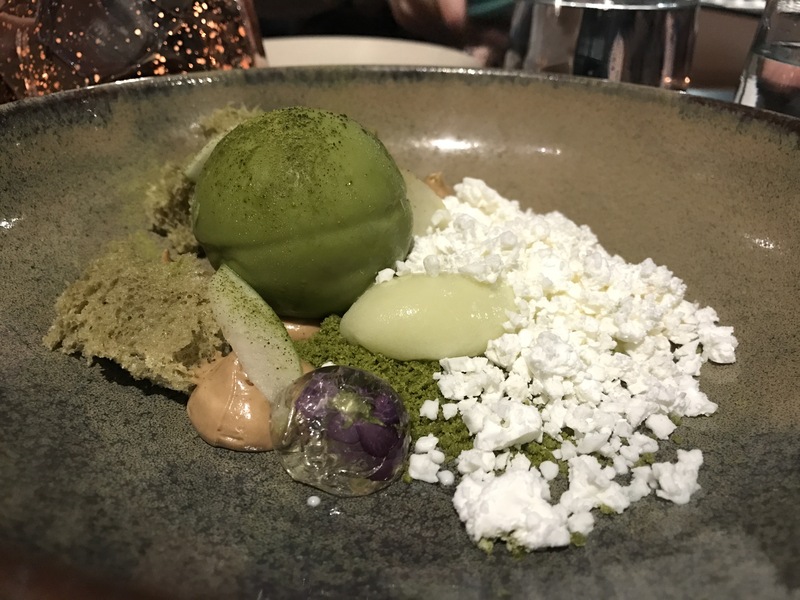 I had the best time with other foodies at the Food Lovers Trivia Night for Oz Harvest; it is such a wonderful cause and another bonus was when TimmyC surprised me by winning the silent auction that allowed us to have a degustation at Tetsuya’s with matching wines. It was amazing to have a tea pairing with our degustation, I’ve never had one before. The teas varied from hot and cold and also carbonated. Each tea was chosen especially to compliment the food from darker teas for meat courses and the most sweet-smelling concoction served with dessert. 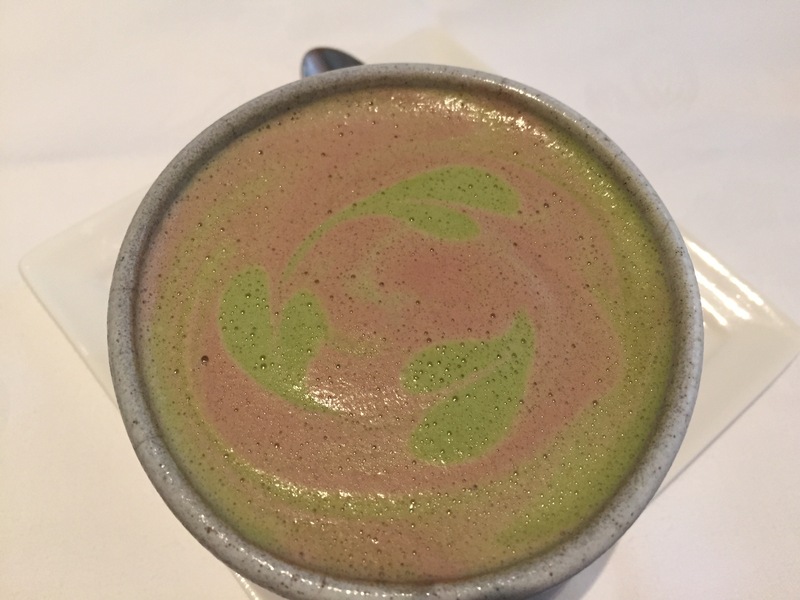 I loved it all (although as a result of so much tea, I did go to the bathroom a lot) but my favourite might have been the cocoa with matcha as I’ve never had anything like it. Buddha’s tears brewed with spice and orange peel. Single estate organic sencha green from Kyoto stirred with lime. Gently infused darjeeling with thyme, rosemary and basil served chilled with bubbles. Yunnan red from one of China’s most ancient tea growing regions. Orange pekoe brewed with red fruits and vanilla pod. West African red cocoa with soy milk and macha. The staff were very attentive and very knowledgeable which always adds to a good experience. Our 4 hour lunch just flew by with incredible food, drink and company. See my first experience with terrible photos here.